TemperTimer is a application for the Apple iOS platform which runs on an iPhone, iPod Touch and an iPad. It is used when disciplining a Child when using the time-out method. It is also commonly refered to as the naughty step method. TemperTimer is very easy to use, even with one hand, which is a wonderful attribute especially if you have to guide the child being disciplined with the other hand. 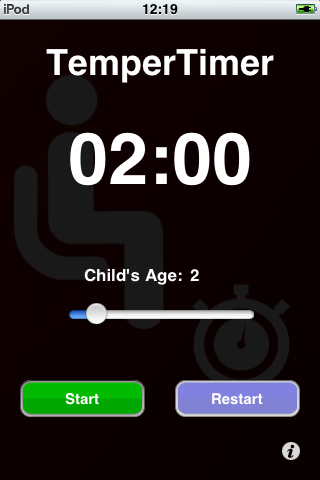 To use the TemperTimer you must first select the child’s age who you are disciplining, then press the start button. TemperTimer will allocate 1 minute of time per child year. So for example if your child is 4 years old then the time-out will be 4 minutes. 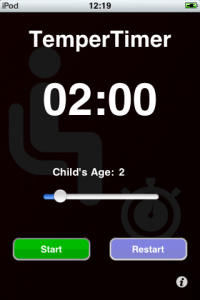 TemperTimer has a restart button which is used in the event that the child has moved from the naughty step before the countdown has finished. This will reset the timer and restart the countdown. We hope you enjoy using TemperTimer, however if you have any questions, have found a problem with TemperTimer or would like to request a feature then you can contact our support team at support@tempertimer.com.